So This Is Where Colors Come From! On Thursday I had the privilege and pleasure to attend the opening night party for the Color Factory. I was surprised by how much fun I had there (I really had a whole, whole lot of fun) and even more surprised by how many old friends I ran into there. So many friends were there that I hadn't seen in ages! Everyone was just in town celebrating their connections to the Color Factory. And what connection was I celebrating? My friend Rebecca was a big helper on the Color Factory project and she did me the solid of inviting me out to the opening. Thank you, Rebecca, for getting me in to see all the colors and eat all the treats. And if you're asking "What is the Color Factory?" I think the following photos will answer that pretty well. But you can also go to their website to learn more. Or just read me say "It's a procession of color-themed art installations with treats in most of the rooms." Standing in the shadow of a Soho hotel, we find the Color Factory space. I don't even make it inside before I start having run ins, spotting my friend Eric and then my friends Angie and Greg. After a lot of time talking to my reunions, into the Color Factory I go. (By now I should have mentioned that I was there with Patricia). Oh look it’s Lindsay and Bryce! Patricia and I drew really good blind contour line portraits of each other. While I was in the color disco I met famous NYC illustrator Jason Polan and my favorite Mexico City Instagrammer, Abby Clawson Low — everyone buy her book when it comes out!! In this room you had the option of getting spun and I got a lot more spun than I was expecting. I'm still feeling a little nauseated from it. 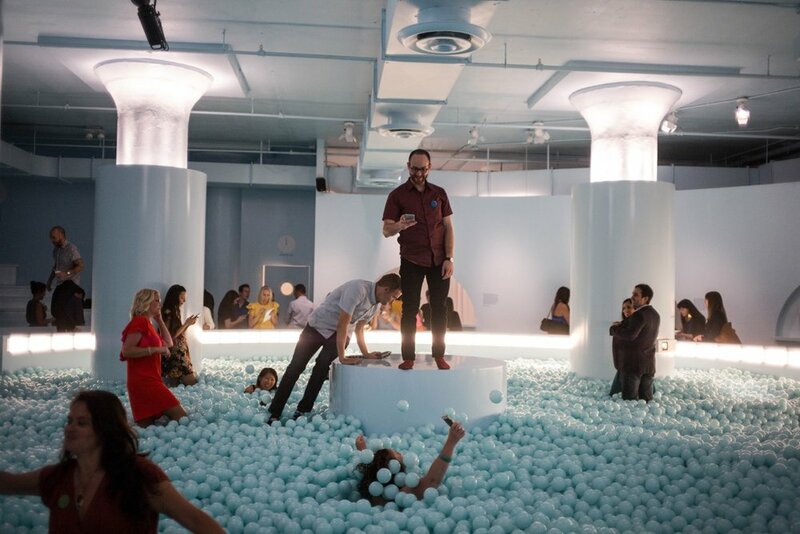 The grand finale was an absolutely gigantic ball pit in a completely unexpected shade of blue (paired with blue gelato of absolutely no flavor). Claire and co-workers (tbh, Claire was the one person I had a hunch I might see at the Color Factory). But my least expected reunion was Karen, who I hadn’t seen since our trip to Brazil about 9 years ago. Bonus points for her being with Clay, who I hadn’t seen for long enough that I didn’t even know he lived in New York now. And here’s Greg and Angie. People picking out their Color Factory gift. This is a map that our Rebecca made. A little more Color Factory and then back to the lobby for more reunions, like seeing Jared and his niece and then watching the Color Factory brain and work trust take a group photo. So, in conclusion, I really had a good time at the Color Factory. Good enough to think as I left "Maybe I'll come back to the Color Factory again?"